Enshrouded in an air of aristocracy and nostalgia, the 5-star Micra Anglia Boutique Hotel in Andros Island is an elegant accommodation choice for visitors who wish to capture the pure romance of Andros’ past grandeur, whilst staying in an exquisite 19th century mansion. Welcome to the most aristocratic island of the Cyclades, the place where time seems to stand still in an epoch of majestic grandeur and European charm. Here, the affluence of one of the strongest merchant shipping powers of the 19th and 20thcenturies is evident in the imposing neoclassical architecture, the grand churches and the quaint cobblestone alleys, making Andros a highly sought-after destination. In the Chora of Andros, a majestic mid-century mansion has been transformed into an escapist’s heaven, a romantic getaway frozen in a time of magnificent, dignified elegance and gentility. The Micra Anglia Boutique Hotel in the Chora of Andros is the place that will host the fairytale-like holidays of your dreams; an authentic experience in romantic nostalgia, merged in harmony with the indulgence and convenience of modern day in an imposing manor that is as historically significant as it is beautiful. 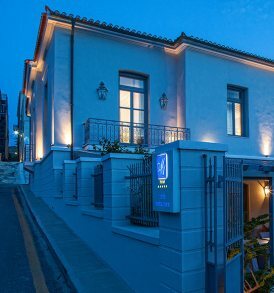 Welcome to your Andros holiday haven, the sublime Micra Anglia Boutique Hotel. The island of Andros is also known as Micra Anglia, literally meaning Little England in Greek, an affectionate sobriquet it earned due to its strong naval and merchant shipping force in the late 19th to the early 20th century. During that prosperous time, the Chora of Andros flourished, and aristocratic mansions with a majestic European air were constructed. Marble, stone and wood intertwined in intricate detail and artistic inspiration are at the foundation of the era’s typical style. Beyond that, the affluence of the time is evident in the entire Andros Chora; imposing churches, stately municipal buildings and alleys that bring to mind nostalgic postcards. Today, the mansion where Micra Anglia Boutique Hotel is housed is a beloved historical landmark of Andros, maintaining all its outlandish allure and the romantic aura of its glorious past, at the same time as offering upgraded accommodation in an elegant and sophisticated space. The hotel was designed bearing in mind the history of the building, its outstanding architecture and every modern convenience that today’s travellers require for a transcending experience, a link between modern day and the idyllic Andros of the past. The superb rooms and suites of the 5 star Micra Anglia Boutique Hotel are the highlight of a relaxing holiday in Andros. Marvelous rooms and exquisite suites offer tranquility and ultimate indulgence in spaces where crisp white contrasts with natural elements such as the oak floors, lush marble and stone to create a soothing ambiance. Authentic finesse and elegance of a past time, as portrayed through the lavish linen, the luscious inviting beds and the neoclassical décor is the scenery of your most romantic and heart-warming stay, in one of the Aegean’s most aristocratic islands, Andros and the superlative Micra Anglia Boutique Hotel.